Death Race is easily one of my favorite arcade games of all time. Unfortunately, it is hard to emulate. The cabinet was essentially electronic so no rom dump was possible. There is a MAME version running via a Ms. Pac Man hack though it is difficult to obtain. I wrote this based almost entirely on memory for a cabinet buildup. 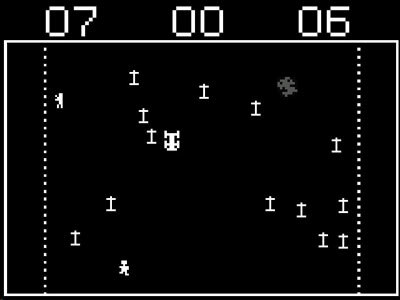 This is a rough single attempt to generate a playable version of the game, Death Race, by Exidy. I had acquired a cabinet sans breadboards and was planning to design a multicab for Death Race (emulation, console versions) and Carmageddon. This version should map easily to an iPac. I have since acquired a working Death Race cabinet and will likely not update this further unless substantial interest arises. It is important to know that I had little to base my graphics on and nothing to base the game play on when I wrote it. The sprites do not match the ones in the cabinet (I had no good pics of them) and the sounds are merely a compilation of freeware screams. Nonetheless, it is pretty fun and can be played by 2 players simultaneously. Note: You have to back off of tombstones and barriers. Email me with problems, fixes, comments, or suggestions. I will get some hires pics of the artwork to Gawker at some point. I had looked for the whole artwork set when I had considered building a cabinet entirely from scratch and could not find the set anywhere. I will make an effort to get hires images of at least the rough cabinet art, the marquee, and the bezel. THIS IS FREEWARE. “Death Race” is licensed to Exidy 1976. THIS SOFTWARE IS NOT TO BE SOLD UNDER ANY CIRCUMSTANCES. Also, it is unlawful and just plain wrong to run over people in real life. The sprites in this game represent cannibal zombies or gremlins, as they did in the original game. This is a clock screensaver of our version of Death Race inspired by the Pong clock by Buro Vormkrijger. The right car (grey) scores every minute and the left every hour. "DR Clock.scr" along with the "clockcontrol.dat" and "clockdxmode.dat"
alongside other screensavers in the Windows folder. The game is written in Dark Basic. System requirements are set by this (www.darkbasic.com). The game runs fine on my development laptop (windows XP) but I have not tested it on many other computers. YOU RUN THIS AT YOUR OWN RISK. I have had some problems in the past with other programs due to file writing used by darkbasic. Hopefully not a problem as the dat file writing (high score table and diagnostics) have not been included as yet.